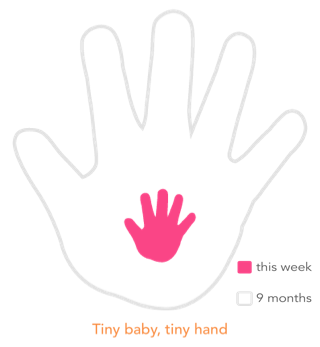 One of the pregnancy apps I use shows me how big Baby Madelyn’s hand is (illustrated in pink). At almost 16 weeks, it’s tiny but growing! As an expectant mom, it’s hard not to worry. Online and in books, you read about your compromised immune system and your increased chance of getting diseases with scary names: toxoplasmosis, listeria, and haemophilus influenzae. You hear that you’re more prone to urinary tract infections, and that the common flu can increase your chances of pneumonia and lead to premature labor and delivery. You read that you shouldn’t eat deli meat or soft cheeses, that you shouldn’t take hot baths, and that you shouldn’t take over-the counter medications. You run into lots of shouldn’ts. When you know that your baby is only the size of a peppercorn or a blueberry, you can’t help but think about how vulnerable that tiny being is, and you feel like your sole job is to protect it from getting squashed. The farther along I got in my first trimester, the less I worried about what I would contract and how it might harm my baby. But there’s one fear that’s always been hard to part with: the fear of cancer. Cancer and I have never gotten along well. We met when I was 8 years old, a happy-go-lucky little girl who’s experience with sickness was limited to colds and chicken pox. That changed when my mom was diagnosed with breast cancer. She was 36, only six years older than I am now. She died at age 40, after the cancer spread to her bone marrow, her liver, and her brain. I was 11. My mom was scared when she first detected a lump in her breast, so she waited months before seeing a doctor. During that time, her cancer could have metastasized. A couple years after my mom died, my maternal aunt died of breast cancer. She was 52. Although cancer left my life years ago, I’ve never really recovered from the abusive relationship. At one point during the first trimester, I woke up in the middle of the night and started worrying about the sun spots and moles on my body. I got up to look at them in the mirror and wondered, “What if I have skin cancer?” I started surfing the Web and found several articles that said melanoma can metastasize to the placenta and the fetus. The next morning, I made a dermatologist appointment and later learned that all of my moles — or beauty marks as my mom used to call them — were fine. It’s funny how the emergence of a new life can make us more worried about the one we have. I can’t help but think about my mom as I prepare to become one myself. I think about how I want to be there to celebrate my daughter’s high school and college graduations, her first job, her marriage, her own pathway toward motherhood — all the milestones that my mom and I never got to experience together. Because my mom was diagnosed with cancer so early in life, I decided to get tested for the BRCA gene mutation a few years ago. Fortunately, I don’t carry it, although my chances of getting cancer are higher than I’d like, given my family history. The genetic counselor I saw said there’s a 27% chance I’ll develop breast cancer in my lifetime, compared to 10% for the average woman. Sometimes, the 27% chance seems high to me. But then I flip the statistic around and remind myself that just because my mom died from breast cancer at an early age doesn’t mean I will. I recently asked my dad to call my mom’s former oncologist (who still has a practice) to obtain her medical records. I realized that I don’t know very much about the specifics of her cancer, and I want to find out more. I should get the records in a few weeks. I’m the type of person who likes finding out answers to questions from my past, who is comforted by having more information than not enough. This has become even more true since I started doing research for my memoir. It makes sense, then, that I’ve read so much about what I should and shouldn’t do during pregnancy, especially during the first trimester when the risk of miscarriage was much higher. During the first two months of my pregnancy, I thought a lot about how the themes of loss and motherhood have been so prevalent in my life — and how the potential for either one was literally inside of me. I could bring this baby into the world and become a mom, or I could lose my unborn child. 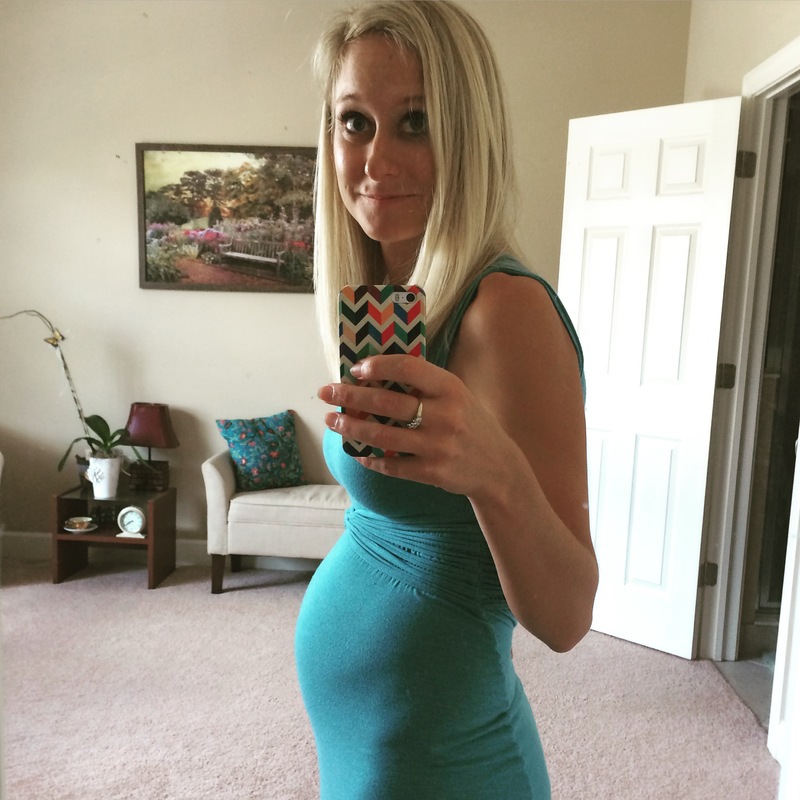 Baby bump photo at 15 weeks pregnant. I’ve been looking for ways to replace my pregnancy fears with reality checks and with curiosity — about where the fear stems from and why. I’ve also sought comfort in prenatal yoga, journaling, and talking with Troy. Having read the book, I feel like I now have a better sense of what’s ok and what’s not ok, and can make more informed decisions because of it. I’m not about to start drinking wine every night (or at all, for that matter). And I don’t want to chow down on unpasteurized cheese, but I’m also not going to freak out if I accidentally eat a bite of it. I’m going to do what feels comfortable to me, what feels right. In this second trimester, pregnancy feels right. It’s incredible, life-changing, and physically uncomfortable all at once. But I love it — and the beautiful little baby it will soon bring us.